In setting out to build a bike capable of taking the rigours of fixed freestyle riding with their new Persona, Identiti have also produced a bike that's a great, rugged round town urban machine. Fixed gear freestyle is definitely gaining popularity, it has progressed somewhat from the circus balancing acts better suited to performers in leotards to something a little more burly although those skinny jeans could be mistaken for denim leggins or jeggins *shudder*. Big stair drops and aerial tricks are more de rigour, requiring a bike far stronger than your standard track iron. And regardless of what you think of this non free-wheeling stunt bike phenomenon, what has evolved from this new genre are rugged bikes that are clean, minimalist looking bikes that are nippy and strong, making them pretty handy around town, like this one, the Persona from Identiti. Identiti are well known and highly regarded amongst the trail hardy mountain bike scene, producing innovative and trusted jump bikes and 4X mountain bikes backed up by a strong team of sponsored riders. Now Identiti are mixing up the influences of their heritage into a track bike that can take the rigors of 700c trick riding which brings us the Persona. What we have is a frame that keeps the tight, upright, geometry of a track bike and built from strong double butted 4130 Cro-mo steel, then reinforced where it is most needed. A heavily gussetted head tube (hiding an internal Campag type headset) should prevent the headset from flaring or cracking and there's enough clearance for the front wheel to miss the down tube so you can spin the bars and a sloping top tube for more manoeuvrability and stand over are the most visually apparent tweaks. 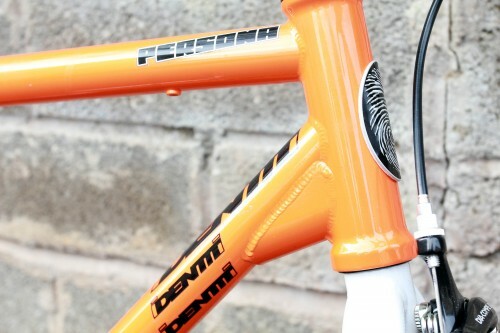 It is like a bastardised semi compact race frame, skinny yet tough. You still get a fairly high bottom bracket and the stable track geometry which makes slicing between wing mirrors a less nervous operation and track stands are a cinch with such a small amount of trail from the fork. The rear drop outs use the Taper-Lock wedge-shaped horizontal slotted system that when used with a special keyed washer self tensions the chain when tightening the axle nuts negating the need for chain tugs. 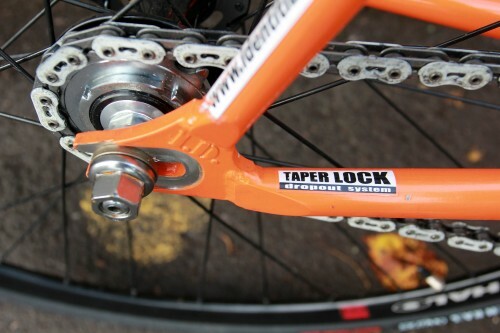 And because the taper wedge goes thicker towards the crank, the wheel won't get pulled in, loosening the chain. It works so well that you wonder why all horizontal drop outs aren't made like this. In keeping with the clean lines of the frame the cable guides for the rear brake are removable, unscrewed from beneath the top tube, which is very neat. Also, to personalise your ride Identiti supply the bike without any of the decals applied and instead provide you with a couple of sticker sheets for you to paste them where you like if you wish to do so. Our bike came in a bright orange which has a bit of a metallic glint to it and a mix of white or black components that makes it look more like an over grown BMX and a strong contrast against the drab grey concrete of the city. Or you can choose the bike in a stealthy all black ensemble with everything black apart from the white plates on the side of the chain. The chain by the way is the excellent Gusset Badger chain, designed for bashing and grinding yet with an effort to keep the weight down. You might think that all this extra strengthening to handle the assault of aggressive street riding would whack the weight up but this complete bike lands in at 9.88kg (2.3kg for the frame only) including pedals which I think is pretty impressive and especially good for the 550 notes that this set up would set you back or £250 for the frame only. For Identiti to be able to give you such an apparent bargain the entire bike is built from own branded components from the Ison distribution stable namely under their Gusset, Genetic or Halo Marques. Just because they are own branded components doesn't mean they are stickered up OEM tat straight out of the Tawain catalogue, oh no, Ison put a lot of time and money into designing and developing new, cutting edge, product that is thoroughly tested by their pool of extreme riders. Check out the videos of Chris Doolaly on Youtube crashing about on his practically stock Persona with the only changes being a lighter set of Gusset 853 cranks, riser bars and the wider Aerowarrior wheel rims and you will get an idea of the sort of abuse this bike can put up with. 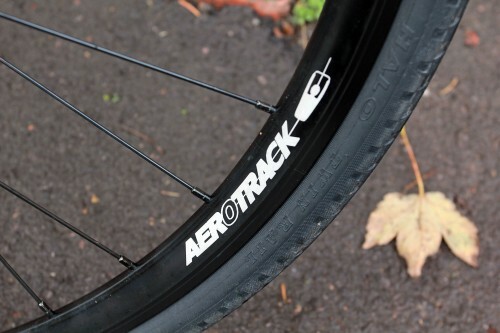 Starting with the Aerotrack wheels with their 27mm deep aero section and a machined braking surface. These wheels are pretty tight and can take a fair amount of pranging, you don't need to be hucking off stairs to give your hoops abuse, cycling over the pot holes which seem to be emerging everywhere on our roads can cause delicate wheels to fold in an instance but these seem to have enough substance to stay true and that threading a line between all the imperfections in the road can be a little less erratic and slightly more subdued knowing that your wheels are going to hold together. The tall air chamber of the 29c Twin Rail courier tyres help dampen the road buzz which is greatly needed because this frame is so stiff and solid that if you have the tyres pumped up beyond 100 psi your wrists will feel it and your eyeballs will rattle. The Twin Rail tyres are easy to skid and make a sound like your dragging your back pack along the ground when doing a broady! The hard-ish compound and puncture protection will keep you rolling and skidding with confidence. This frame doesn't have the zing of a high end steel road bike but that doesn't mean that it feels dull and boring either, it does exactly what you ask it to do without any fuss or flex, every hard crank is fed directly into the wheels and the short rear chain stays make this bike accelerate well and get the power down, but it feels solid rather than lively and at 5.1lbs for the frame it isn't exactly heavy. The straight bladed cro-mo forks are very direct and solid too and this is telegraphed through the welded cro-mo stem and handle bar combo which Identiti whitily call their 'single bar'. The one piece unit looks smart, simple and un-cluttered and the wedge bolt clamped the steerer securely and doesn't disturb the aesthetic either. My only gripe was that it too was very stiff and direct in feeling and the cheapo grips did nothing to stop the bumps from the road being felt in my eye sockets, maybe my bones are getting old but with the tyres at 120psi I found the bike a bit tiring but that could also be down to the fun I am having on it too? No eyelets for mudguards or racks or even water bottle holders are provided. To me this shows that the bike is aimed at fun and not to be taken too seriously - even if you aren't going to be popping tricks on it this is a short haul urban machine. I guess if you are looking to go longer range you could fit generic clip on guards, but I'd also guess if that was your main sort of riding you wouldn't be looking at this bike in the first place. That said, the lack of guards is not an insurmountable problem. 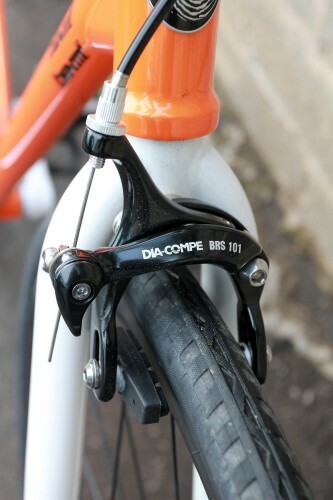 A set of Dia compe calliper brakes and generic black levers are supplied and gripped admirably on the machined braking surfaces of the wheels but couldn't be described as the strongest of stoppers. The pedals too were a bit so-so, the alloy bear trap type pedals looked like they belonged on a hybrid not a bright young thing like the Persona. The saddle looks a bit cheap and plasticky but was in fact very comfortable and actually quite lean. Its synthetic cover was easy to clean though. There isn't much to talk about with the drive train on a fixie but what we have on the Identiti Persona is a dependable Genetic crank with stiff and solid forged and CNC'd arms that are no lightweights, a chain that won't break in a hurry and a stainless steel cog. If you ride your fixie hard then you want these components to be strong and these are. If you want to save weight on this bike without compromising strength then the crank would be the component to swap, everything else is very well chosen for its performance in weight and strength. Identiti have managed to produce a town bomber to a high spec which will give a lot of fun to all types of rider after the low maintenance, single gear experience regardless of whether they want to jump off things. 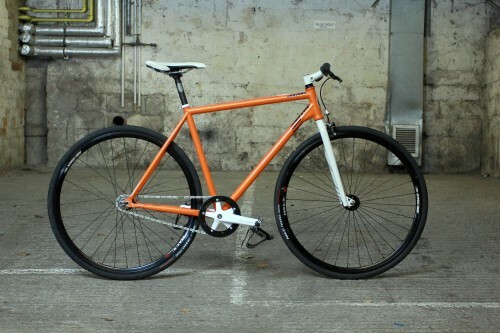 Urban fixed gear single speed bike, that will allow you to develop and ride in your own individual style. A fast single gear town hack that is built tough and specced well to take the pounding of freestyle riding. The bones of this bike is the fantastic frame and fork, available separately for £ which represents excellent value for money. Double butted 4130 cro mo steel. Tweaked track frame geometry. Still very upright and responsive, not much trail on the forks makes you move you body more to get round corners than turning the bars. Short rear chain stays for very direct quick acceleration and making it easier to pop up onto the back wheel for tricks such as wheelies or bunny hops. Good amount of stand-over height from the sloping top tube, similar to what you would find on a mountain bike. I found the bars quite low for tricks and would opt for a slightly shorter stem and some riser bars if I was that way inclined. This bike is solid which is especially noticeable with the tyres pumped up to anything over 80psi despite the tall 28c twinrail's it is shod with, my wrists felt the brunt of this bikes stiffness. This bike is built to be strong not super light and that translates to thicker tube walls which don't absorb the trail buzz like a top end steel frame would. The bike felt sturdy and sure footed and that inspires confidence and makes you feel like you can tackle anything. This bike is stiff EVERYWHERE! Cranks, bars, forks, frame, all stiff and solid. It has the direct feel of a BMX, no flex detected apart from the wheels but even they were tight. Short chain stays and stiff tubes mated to solid cranks gives a very direct power transfer. The one piece cro mo steel stem and handlebar doesn't twist much either. How would you describe the steering? Was it lively, neutral or unresponsive? the upright track geometry make you steer more with the bike thant the bars. Very responsive at speeds below 20mph. The tight geometry allows you to weave the bike easily and pick lines along the road, avoiding the pot holes and slippery ironwork. I liked the look of the one piece stem and handlebar but felt that they were very uncomfortable both in their shape (too straight) and how brutally stiff they were. I was pleasantly surprised with the saddle but it may be a bit too narrow for those with wider sit bones. All the components were very well chosen and definitely a good choice for durability but maybe not for weight. The one piece handlebar and stem was very stiff, all the shock sent though the stiff frame and fork went straight to your wrists! Maybe a thicker pair of grips like some Oury's would help or some fatter again tyres like the Schwalbe Kojaks 35c. The crank was impressively stiff but pretty heavy, if you replaced it for the equally stiff Gusset 853 cranks that would save a heap of weight. The Gusset Badger chain is a brilliant fixie chain, it is very strong and surprisingly light for such a tough chain. The wheels held true throught the test. Tell us some more about the wheels and tyres.Did they work well in the conditions you encountered? Would you change the wheels or tyres? If so, what for? The tyres offer are fairly hard and easy to skid and the grips give a bit more confidence on greasy roads. The wheels remained true and were fairly light and they looked good which is always a bonus. less parts to go wrong. So very stiff plus the grips were pretty awful. Swap the grips because they are a bit naff. The pedals are nothing to write home about but despite their generic town bike looks they served a purpose well. Anything further to say about the bike in conclusion? A hybrid track bike with more in common with a BMX than a mountainbike. Glad they added fittings for a rear road brake -riding down hills on a fixie! Get an end on that brake cable sharpish before it frays.